Experience yoga culture and tradition of India! Join thousands of students from all over the world who have experienced the true meaning of peace through the unique and attractive approach to teaching yoga. Whether you are a beginner or advanced in your practice, all yoga practitioners are welcome and encouraged to join this 70-day program, a yoga program deeply devoted to spiritual growth and understanding! 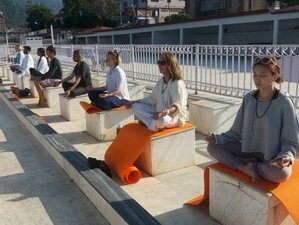 During this teacher training course, you will be accommodated at Rishikesh Yog Sansthan in Rishikesh, India. Upon completion of this yoga teacher training, students are eligible to register with Yoga Alliance as Registered Yoga Teachers (RYT®). Registration with Yoga Alliance provides a globally recognized credential. This course is created for individuals with aspirations to become yoga teachers but is suitable for anyone wishing to further develop their yoga practice. Throughout the course, students will learn this program that meets Yoga Alliance standards in a stimulating and welcoming classroom environment that meets their individualized skills. Students will leave the program with the knowledge, experience, and confidence to become the yoga teacher of their dreams. Students can experience the spiritual growth, balanced personality, healthy food habits, overall transformation, etc. while studying the 200-hour followed by 300-hour yoga teacher training courses. There will be flow in the student's learning processes and growth. Always discipline, respect teachers, and follow all rules. Always be on time. If you are late, you will not be permitted to join classes. Clear the books from your account before departure from Rishikesh Yog Sansthan. Before departure, return any other stuff if taken. Rishikesh Yog Sansthan provides accommodation for students who join yoga classes. So, any friends or relatives will not be included in the accommodation. Students have to be present in all scheduled programs of Rishikesh Yog Sansthan. Rishikesh Yog Sansthan is not responsible for any mishappenings before the course schedule. The 500-hour yoga teacher training will be combining the 200-hour of training followed by the 300-hour. This teacher training course will take place at Rishikesh Yog Sansthan in Rishikesh, India. Breakfast, lunch, and dinner are provided. You will have the opportunity to go on small outings. Please book your flight to arrive at Jolly Grant Airport (DED) in Dehradun or Indira Gandhi International Airport (DEL) in Delhi.